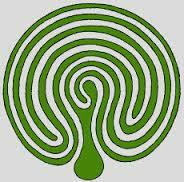 The Labyrinth as a tool for Re-Wilding. My journey with the Labyrinth has been an unexpected and synchronous one. It started one Summer whist looking after a Permaculture Farm in County Wicklow, Ireland. Myself and a friend had been given the job of replenishing the ‘Herb Spiral’ at Carraig Dulra Permaculture farm. We instinctively used the spiral path as a walking meditation, setting intentions and in sacred ceremony. It wasn’t until two years later that I came across the work of Eve Hogan that I then realised the ‘Herb Spiral’ was also a 3 circuit classical Labyrinth. So two years on I followed the signs and ended up in Scotland doing a Labyrinth Facilitators course with veriditas www.veriditas.org, it deepened my knowledge and understanding for what this ancient archetypal symbol was about. Energy flows in Spirals. From the Spiralling of the Galaxies and planetary bodies to water down the plug hole, in a seed head or the shell on a snails back we see this spiral design throughout nature and it is within us as the spiralling DNA strands and of spinning energetic chackras. Connecting the dots…Walking the path… At a recent event, ‘Plant Consciousness’, I met Dr David Bruce Leonard, an amazing guy who has studied extensively with Hawaiian Plant teachers. His was the first stall I wandered over to and picked up his book by the name of ‘WildWisdom’! In the middle of the book he has a Labyrinth!! Dumbfounded I asked what the connection was and he tells me its the best thing he’s ever found that connects an individual to the state of consciousness that is required when out collecting medicinal plants!!! The Labyrinth is a great tool for bringing our awareness from the exterior in to the inner realms of feeling, emotion and awareness, also bringing our sight to the peripheral vision that the Hawaiian Healers use in their meditation technique of Hakalau that David Bruce Leonard was taught by his Teachers. You can practice Hakalau by staring at a fixed point just above your line of sight, as you focus all of your attention on this point after a while you will notice the peripheral field coming in to your awareness, now concentrate more on your peripheral vision than the centre point. The Hawaiian Plant medicine practitioners would use this practice, along with bodily awareness whilst out collecting plants for healing an individual. They would hold the vision of the person they were collecting plants for and in their altered states were able to ‘hear’ which plants were needed and in what way to use them. 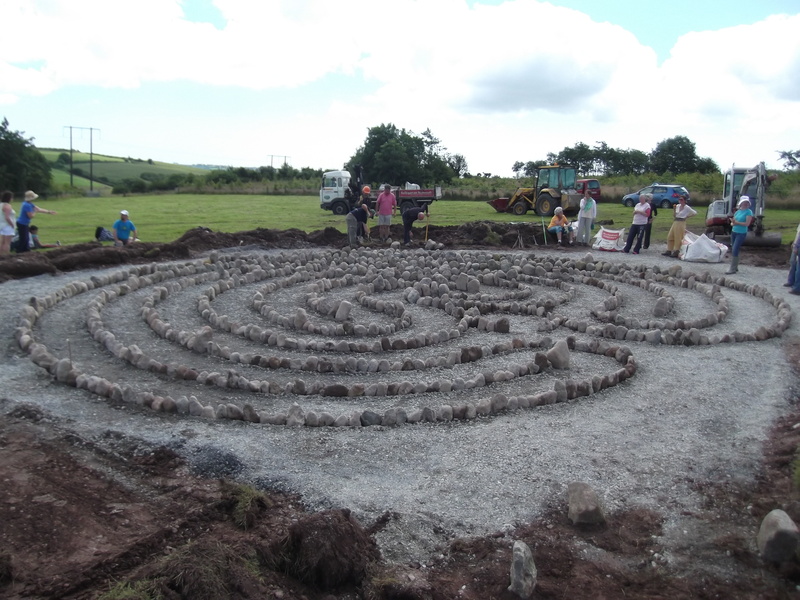 Below is a picture from ”The Art of building a Healing Labyrinth” course I attended with Geomancer and Master Builder Dominique Susani in Co.Cork. Ireland 2015. The Labyrinth was built using exact measurements and equations worked out by the locations latitude in relation to the Sun and the Moon at Summer Soltice. This gives an equation that can be formulated to give you a harmonised space, Summer Soltice being the highest energetic point in the year. So when you create an object, building or space using those measurements you are creating an energetically harmonious space. The tradition of the European Master builders went back to the Druids who built sacred sites, many sacred sites around the Globe, e.g. certain Pyramids, many European Gothic Cathedrals would have been built using this knowledge but like many things today its something we have lost, our connection to nature, but that is what we are reclaiming! David Bruce Leonard’s website – http://earthmedicineinstitute.com – David’s School in Hawai’i. Dominique Susani – http://www.sacredgeometryarts.com – Sacred Geometry Products. Categories: Uncategorized | Tags: alternative education, art, art therapy., Book Illustration, Earth Medicine, Hakalau, Herbal medicine, Herbalism, Herbs, Indigenous wisdom, Labyrinth, Labyrinths, nature Immersion, nature therapy, Plant Consciousness, present moment awarness, Re-wilding, Spirituality | Permalink.